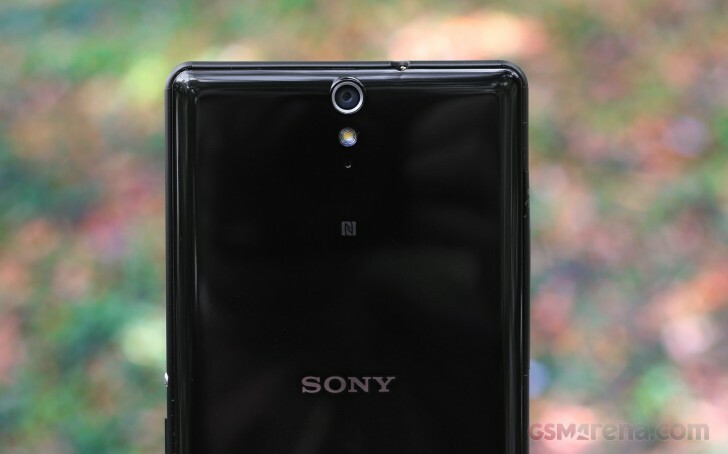 The Sony Xperia C5 Ultra offers two AF 13MP cameras, both featuring Exmor RS sensors. The rear camera is equipped with a 25mm wide 13MP Exmor RS sensor. It shoots images in a native ratio of 4:3 up to a maximum resolution of 4,096 x 3,072 pixels (so, it's actually 12.6MP effective resolution). The imager is placed behind a fast f/2.0 lens. A single-LED flash is on board to assist with low-light shooting. 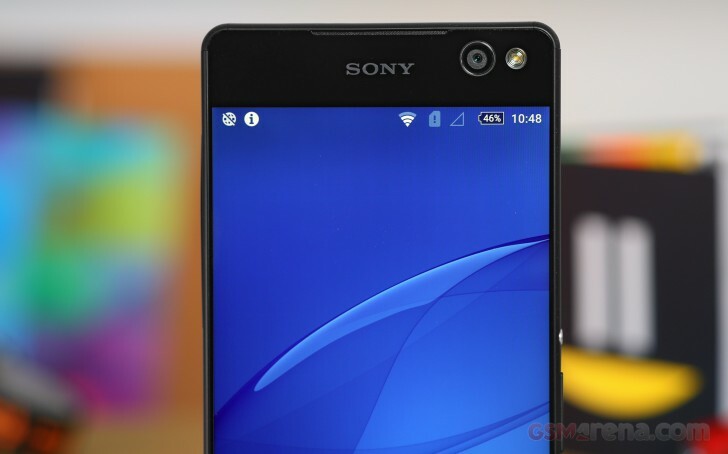 The front camera is another 13MP Exmor RS sensor, this time around it's behind a 22mm wide f/2.2 lens. If it's not obvious, 22mm means a ridiculously wide field of view. This camera comes accompanied by a single-LED flash on the front as well for some flashier selfies. The Xperia C5 Ultra also has a two stage hardware shutter key that you can set up to unlock the phone and start the camera. It can also snap a photo or start capturing video immediately. As is typical for Sony smartphone cameras, the Xperia C5 Ultra shoots in Superior auto mode by default, which in this case can shoot at full 13MP resolution, though you can select a lower one, as well as a 16:9 aspect. In theory, the C5 Ultra should recognize among a total of 52 different scene types and adjust settings accordingly - including enabling HDR mode if needed. You're left with little control over the process other than a flash mode selector and a choice of the aforementioned aspect ratio. No matter if you choose Manual or Superior Auto, the auto exposure is dependable and together with the decent dynamic range results in well exposed photos. The images are on the soft side though, and perceived detail suffers, though most of it is there and can be pulled with a touch of sharpening in post processing. There's a fair amount of noise in areas of uniform color (like the sky), but it's of the preferable luminance type, so it's not overly distracting. Sometimes the Superior Auto makes the color punchier, which is OK if you like this kind of images, while the Manual keeps the color rendition as close to the real life as possible. Naturally, there's an HDR mode, which is accessible only in Manual mode, though the documentation says Superior Auto can activate it as well. Anyway, we shot a few comparison shots in Manual with HDR off, then on, and the results are below. We get to the Sweep panorama mode, which is traditionally a subpar on Sony's phone cameras, and the Xperia C5 Ultra does well to stay within that description. And it's not like Sony needs to invent something, there are a number of prime examples how a proper panorama mode should work like, but the Japanese just can't be bothered. In their implementation you need to manually select which way you're sweeping, as if there's no orientation sensor or accelerometer. It's then picky in terms of sweeping speed, and you can go too slow, apparently. And if you only want to capture a small sector in your shot, the software covers the rest with a dark gray color, posing the question why it doesn't crop it out, since it obviously realizes there's no data there. You might be willing to close your eyes on most of those issues, if the camera produced quality panoramas, but it doesn't. They are low in resolution and detail, have wavy stitching artifacts and are overall unusable. C'mon Sony, the panorama mode update is way overdue already! Our photo compare tool is at your disposal to check for yourself how the Xperia C5 Ultra weighs up to the competition. The headline front camera creates images up to 4,096 x 3,072 pixels for a total of 12.6MP. Its output is pretty much the same as the rear camera, but has a noticeably wider field of view and thus you may enjoy some great group photos. The 13MP front snapper on the Xperia C5 Ultra is among the best selfie-dedicated hardware we've seen to date and we'd recommend to all selfie photographers to check this phone out. The Sony Xperia C5 Ultra shoots videos up to 1080p/30fps, nothing out of the ordinary. It can shoot HDR videos at full resolution as well, but it doesn't offer fancier modes like slow motion or timelapse or 1080p/60fps, for that matter. The resulting FullHD videos come out with a bitrate of 17Mbps and audio is recorded in stereo at 128kbps. In terms of quality, the videos are far from spectacular. Detail levels are average, and so is dynamic range. The focusing mechanism and the exposure don't hunt unnecessarily, but we'd still prefer if those kept trying at a lower pace. We don't recommend using the software video stabilization, as it mostly ruins the video quality rather and the cost isn't worth the barely improved picture. Then there's the HDR mode, and much like stills shooting, it mostly overexposes, rather than produce a truly high dynamic range. You can download the untouched samples from the links below.